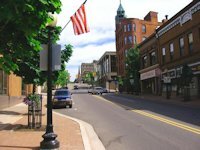 Marquette is the Upper Peninsula's largest city with more than 20,000 residents. 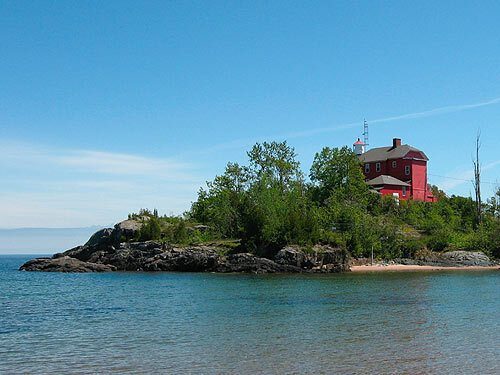 It is located on the western edge of Marquette Bay of Lake Superior. Marquette General Hospital is UP's largest health care complex and its largest employer. The city is also home to Northern Michigan University and 10,000 students. 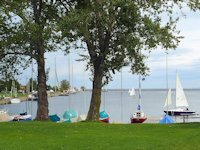 It is the gateway to Big Bay and the Huron Mountains, a recreational mecca for hiking, mountain biking, ATV trails, boating and fishing. 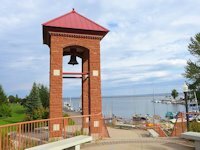 A must-see stop for visitors to Marquette is Presque Isle Park, a rocky peninsula with several miles of walking trails, scenic drives, picnic areas, a band shell with summer concerts, and a nature center. 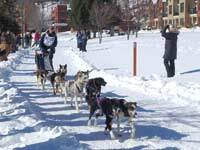 Wintertime offers cross-country ski trails. Marquette also offers a variety of golfing experiences, offering four 18 hole courses from the scenic and challenging Greywalls course to the newly renovated Northern Michigan University course. 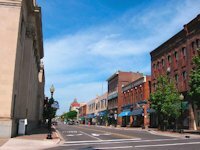 Downtown Marquette offers a nice mix of gift shops, restaurants, pubs, hotels, and convenient access to waterfront walking paths and activities. On the north side of town, the city operates an RV and tent camping park (Tourist Park) with 110 sites on 40 acres along the Dead River. Marquette's early settlement was due to the discovery of large masses of iron ore nearby in the 1840s. It was officially incorporated as a village in 1859 and a city in 1871. The city and its residents have done a great job preserving the old historic brownstone buildings. 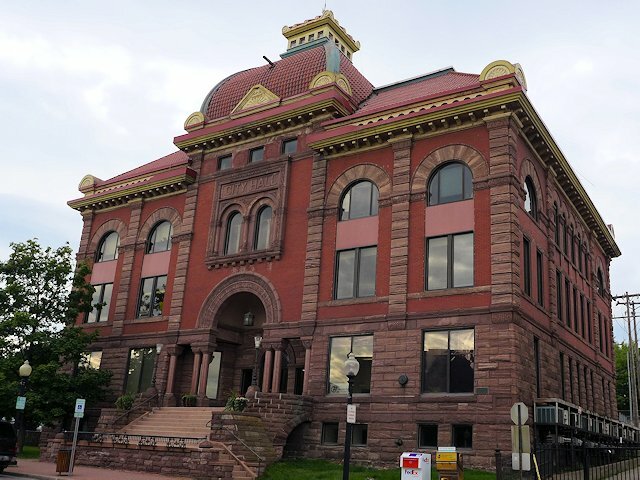 Marquette City Hall, built in 1894-5, is constructed of sandstone and red brick and served the city until the structure was sold and converted to a professional office building in the 1970s. 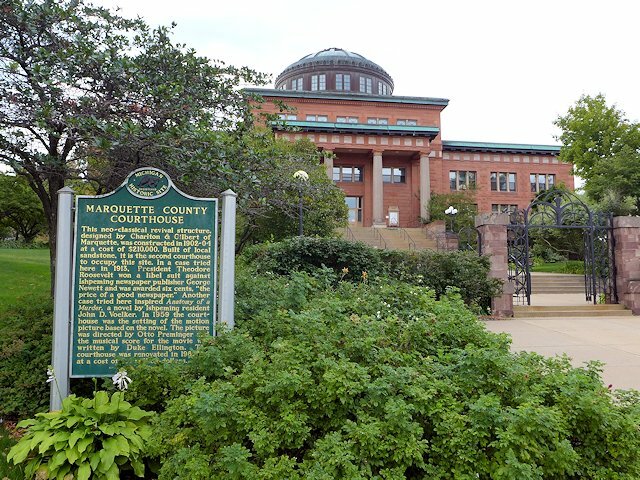 The Marquette County Courthouse, built in 1902-4, is still in use today. In 1959 it was used as the setting for the movie Anatomy of a Murder directed by Otto Preminger. Downtown is well elevated over the lake with trees, benches, and old-fashioned street lamps. While mining remains part of the economic picture, the city is clean, with lots of big trees, well maintained residentail neighborhoods, and nice wooded parks. 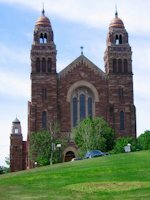 < < < The city is full of classic, well maintained brownstone buildings like St. Peter Cathedral built in 1891-2. 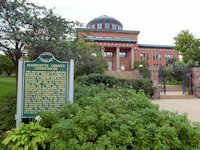 The Marquette Harbor and park is just a few blocks walk from downtown. The Fire Bell Tower anchors the Mattson Lower Harbor Park. The Fire Bell has served the Marquette community since being installed in the Spring Street Firehouse in the 1990's. After it was retired it was placed here at the entrance to the park. The protected harbor provides ample room for sailing. Most of the ships docked at the Marina were sailing vessels with a few commercial fishing ships and power yachts here and there. In the Harbor Park parking lot we found this great example of "Yooper Ingenuity" in this Bulk Milk Hauling truck turned into a muscular Motor Home-RV Camper. 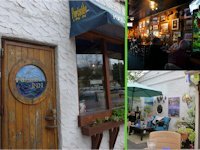 Go Here to see more examples of Yooper Creativity - The Yooper Tourist Trap. Presque Isle Park is a 323 acre forested oval shaped headland/peninsula which juts into Lake Superior in the northern tip of the City. While the park has every other amenity you'd expect, it has no camping. It is a nice place for some walking exercise, scenic views, or a picnic. If you are staying in the area there are summer concerts at the Band Shell, a municipal pool with a water slide, and a Lake Superior beach swimming area. The Tourist Park Campground is open from mid-May to mid-October with 100 sites for either RV or tent camping and 10 rustic sites for tent-only camping. Amenities include a playground, ball diamond, picnic areas, swimming beach, full service restrooms, limited Wi-Fi, and RV dumpwater station. There are several excellent golf courses in the Marquette area including the exceptional Greywalls (below left) and Northern Michigan University's Chocolay Downs Course (below right). Going east towards Munising and Pictured Rocks . . . More waterfalls, hiking pages, and scenic attractions from Munising through Tahquemenon Falls to Sault Ste. Marie.